Once again today I’m traveling to spend time with the dazzling crew over at B’Sue Boutiques. 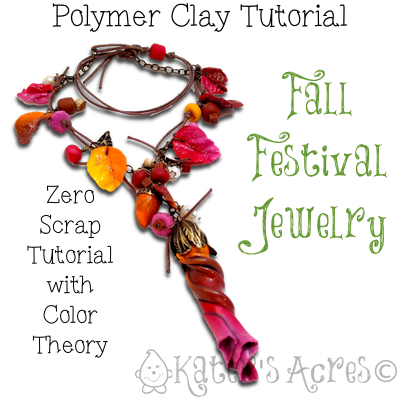 Today we are going to be shooting a video on how to make the component parts to make your own polymer clay fall festival necklace. In order to help you get a better handle on color and how to use it, I have created this 7 page PDF on all the basic information you need to know to create gorgeous polymer clay items. Get the Guide here. Parker’s Club Members got all 3 supplements as part of their subscription in September 2014! Check it out here… and learn how you can become one of the elite! Thanks for the tip Genie! If small portions of the leaves overlap, they generally will not stick and in my experience just fall right apart. However, the thinner the leaves the more this is exactly true that they will stick and not come apart. Thank you for bringing it up.